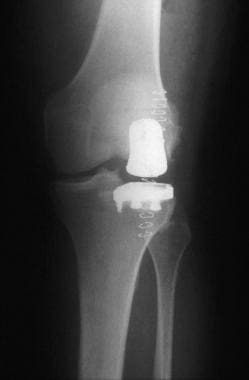 The surgical options currently available to treat degenerative disease of the lateral compartment of the knee include corrective osteotomy, total knee replacement, and unicompartmental knee arthroplasty (See Surgical Options, Corrective Osteotomy, Total Knee Replacement, and Unicompartmental Knee Arthroplasty, below). During normal gait, adduction places force predominantly on the medial compartment. [4, 5, 6, 7, 8, 9, 10] For weight-bearing stresses to be shifted to the lateral tibial plateau of the knee requires the development of a valgus deformity. Moen et al show microscopic and histologic osteoarthritis in the lateral compartment of knees with isolated medial and patellofemoral osteoarthritis as seen on radiographs, with no lateral compartment osteoarthritis on preoperative radiographs. This study helps to understand the progression of osteoarthritis in compartments thought to be unaffected by osteoarthritis based on standard radiograph. For complete information on Osteoarthritis, please go to the main article by clicking here. For excellent patient education resources, visit eMedicineHealth's Arthritis Center. Also, see eMedicineHealth's patient education articles Knee Pain and Knee Joint Replacement. The etiology of lateral compartment arthritis can also include degenerative changes caused by trauma, such as a lateral tibial plateau fracture. Patients with lateral compartment arthritis of the knee joint typically have pain and grinding that are localized to the lateral aspect of the knee. Patellofemoral symptoms may or may not be present, depending on the degree of degenerative change at this articulation. With advanced disease and deformity, patients notice a valgus orientation of the knee joint. For complete information on Osteoarthritis, please go to the main article by clicking ">here. Abnormal gait patterns may result in a limp, back pain, and foot pain. The history may reveal contributing factors to lateral compartment gonarthrosis, such as previous trauma to the knee or a lateral meniscectomy. To reproduce symptoms during physical examination, apply a valgus stress to the knee joint and take the knee through a range of motion. Crepitation can usually be palpated along the lateral joint line during movement and may be associated with swelling and laxity of the joint, which can be detected by application of a varus stress. Careful palpation of the patellofemoral joint can be used to isolate tenderness at this location. If arthritis is localized to the lateral compartment, the knee should have a smooth arc of motion when a varus stress is applied to it. Examination of the other joints in the lower extremities (ie, hips, ankles, contralateral knee) and assessment of the neurovascular status of the limb contribute information that is useful in making the diagnosis of lateral compartment arthritis of the knee joint and formulating treatment options. Lateral compartment degeneration in an active and heavy 39-year-old patient. A patient with pain following a previous surgical procedure in a knee with lateral gonarthrosis should have a workup for possible occult infection. If systemic arthritis is suspected based on history and clinical examination findings in a patient with early changes in the lateral knee, a rheumatologic evaluation and screening may be warranted. Preoperative selection criteria for a unicompartmental arthroplasty include an AP radiograph of the knee with a varus stress applied to the extremity. If this radiograph demonstrates normal alignment of the extremity and opening of the arthritic lateral joint space, a lateral unicompartmental knee arthroplasty is performed. When a patient has existing deformity from a previous trauma to the lateral knee, a CT scan study may be useful in evaluating the osseus anatomy of the knee and in planning surgery. MRI may be indicated in difficult cases to assess the status of other compartments of the knee joint and the cruciate ligaments. If the patient complains of predominantly mechanical symptoms, such as painful catching in the lateral part of the knee joint, and if evidence exists of intra-articular pathology, such as a torn lateral meniscus that is visualized on an MRI, arthroscopy of the knee is undertaken. Arthroscopic removal of the torn portion of the meniscus can relieve preoperative symptoms and allow assessment of the degree of arthritic change in the lateral compartment of the knee and elsewhere. The integrity of the cruciate ligaments and the degree of inflammatory changes in the knee can be evaluated during arthroscopy, and this information is of value in planning future surgical treatment. Knee arthroscopy performed routinely during corrective osteotomy for genu valgum is of questionable clinical value, however. Even in patients who will be receiving surgical therapy, nonoperative treatment can be useful as a temporizing measure, giving the physician time to educate the patient about the disease, to understand the patient's needs, and to evaluate the patient's compliance with a treatment program. The knowledge gained can be valuable in planning surgical interventions. The use of an unloader brace in the flexible genu valgum deformity can be helpful in patients awaiting definitive surgical treatment. Pain relief with bracing suggests that a corrective osteotomy or unicompartmental knee replacement would be effective. The surgical interventions available to treat lateral compartment degenerative disease of the knee are corrective osteotomy, hemiarthroplasty of the knee, and total knee replacement (TKR). Knowledge of the condition that led to lateral arthritis of the knee, careful physical examination, and evaluation of imaging studies will alert the surgeon to the anatomic changes that can be expected during surgery for lateral compartment arthritis of the knee. This may affect intraoperative strategy, or even the choice of procedure. For example, in a patient with a history of a lateral tibial plateau fracture, the surgeon can expect to find deformity and deficiency of the lateral tibia. A unicompartmental knee or total knee replacement (TKR) in such a knee joint may require augmentation of the deficient plateau with allograft or build-up of the prosthesis. During TKR, a hypoplastic femoral condyle may require augmentation with metal blocks on the femoral prosthesis. Contracted lateral soft tissues mandate sequential release during arthroplasty and may preclude corrective osteotomy. Abnormal patella biomechanics may be manifested by lateral patella tracking and degenerative changes along the lateral facet of the patella from a long-standing valgus deformity of the knee. Knee extension loss greater than 15° and flexion less than 90° are contraindications to a distal femoral corrective osteotomy. Severe ligamentous instability is another contraindication to osteotomy because there are no dynamic restraints to medial laxity, which will persist even if the alignment is correct. Poor results with femoral osteotomy have been reported in the presence of preoperative recurvatum of the knee, which may indicate that the knee is at an advanced stage in the arthritic evolution, with TKR being the appropriate option. Same knee as above, treated with a closing wedge osteotomy of the distal femur. A distal femoral osteotomy is the author's preferred option for the young, active, and heavy individual, with the goal of correcting the alignment to neutral. An opening wedge osteotomy is preferred, because this can be performed with a smaller incision, and the hardware can be placed on the biomechanically favorable lateral aspect of the femur. The operation is performed through a midline incision to facilitate later TKR. In the older patient who presents with isolated lateral compartment symptoms and radiographic-evident disease, a unicompartmental knee arthroplasty is preferred. Preoperative selection criteria for this procedure include normal alignment of the extremity and opening of the arthritic lateral joint space on an AP radiograph of the knee joint taken with a varus stress applied to the lower extremity. For patients who have diffuse symptoms in the knee, a history of inflammatory arthritis, obesity, fixed lateral contractures, and evidence of degenerative disease in the medial or patellofemoral compartments of the knee, a TKR will provide more predictable results. Arthroscopy of the knee joint is indicated in the valgus knee if mechanical symptoms are suggestive of intra-articular pathology, such as an incarcerated lateral meniscus. However, routinely performing knee arthroscopy during corrective osteotomy for genu valgum is of questionable clinical value. Clinical outcomes of osteotomy with simultaneous arthroscopic debridement of the lateral compartment are not different from the outcomes in patients who undergo osteotomy alone. In addition to the usual risks expected of a major reconstructive procedure, joint stiffness and nonunion occur more frequently with supracondylar femoral osteotomy than with proximal tibial valgus-producing osteotomy. In selected patients, a unicompartmental knee arthroplasty may be the optimal option for pain relief from isolated lateral compartment arthritis. [78, 79, 80, 81, 82] See the images below. Compared with osteotomy, unicompartmental knee replacement has a higher initial success rate and fewer early complications. Lateral compartment degeneration with localized knee pain in a 59-year-old patient. Same knee as above, treated with a lateral unicompartmental knee arthroplasty. 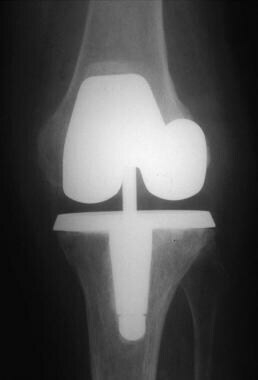 In addition, when compared with a tricompartmental knee replacement, unicompartmental replacement preserves both cruciate ligaments and, therefore, almost-normal knee kinematics [78, 81, 83] ; the surgery can be performed through a smaller incision, with reduced blood loss, expense, and morbidity. Bone stock is preserved in the opposite compartment and in the patellofemoral joint, making revision surgery easier to perform (at least in theory). For complete information see Unicompartmental Knee Arthroplasty. For complete information see Total Knee Arthroplasty. Three clinical series have reported that conversion of a supracondylar femoral osteotomy of the knee to a TKR does not compromise the ultimate result of arthroplasty. [52, 73, 93] Some authors have found conversion of a previous varus osteotomy to TKR more technically demanding, whereas others report increased difficulty when total joint arthroplasty is performed after supracondylar varus osteotomy. The correction of severe angular deformities may require both soft tissue release on the lateral side and ligament tightening on the medial side. [76, 96] Severe bone loss and dysplasia of the lateral femoral condyle may necessitate the use of bone grafts or metal blocks to augment the femoral component. A reasonable option in the elderly patient with a severe valgus deformity may be the use of primary constrained implants. The images below illustrate a severe valgus deformity treated with a primary constrained TKR. Severe valgus deformity in a 68-year-old patient. The deformity is not passively correctable. Same knee as above, treated with a constrained primary total knee replacement. Altman RD, Fries JF, Bloch DA, et al. Radiographic assessment of progression in osteoarthritis. Arthritis Rheum. 1987 Nov. 30(11):1214-25. [Medline]. Gresham GE, Rathey UK. Osteoarthritis in knees of aged persons. Relationship between roentgenographic and clinical manifestations. JAMA. 1975 Jul 14. 233(2):168-70. [Medline]. Johnson EW Jr, Bodell LS. 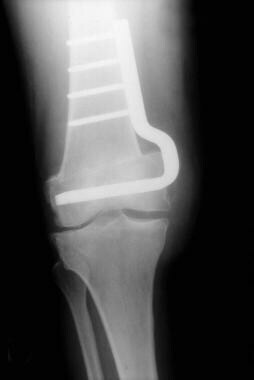 Corrective supracondylar osteotomy for painful genu valgum. Mayo Clin Proc. 1981 Feb. 56(2):87-92. [Medline]. Andriacchi TP. Dynamics of knee malalignment. Orthop Clin North Am. 1994 Jul. 25(3):395-403. [Medline]. Goh JC, Bose K, Khoo BC. Gait analysis study on patients with varus osteoarthrosis of the knee. Clin Orthop Relat Res. 1993 Sep. 223-31. [Medline]. Harrington IJ. Static and dynamic loading patterns in knee joints with deformities. J Bone Joint Surg Am. 1983 Feb. 65(2):247-59. [Medline]. Johnson F, Leitl S, Waugh W. The distribution of load across the knee. A comparison of static and dynamic measurements. J Bone Joint Surg Br. 1980 Aug. 62(3):346-9. [Medline]. Maquet PGJ. Biomechanics of the Knee. New York, NY: Springer-Verlag; 1976. Prodromos CC, Andriacchi TP, Galante JO. A relationship between gait and clinical changes following high tibial osteotomy. J Bone Joint Surg Am. 1985 Oct. 67(8):1188-94. [Medline]. Wada M, Imura S, Nagatani K, Baba H, Shimada S, Sasaki S. Relationship between gait and clinical results after high tibial osteotomy. Clin Orthop Relat Res. 1998 Sep. 180-8. [Medline]. Hsu RW, Himeno S, Coventry MB, Chao EY. Normal axial alignment of the lower extremity and load-bearing distribution at the knee. Clin Orthop Relat Res. 1990 Jun. 215-27. [Medline]. Kettelkamp DB, Wenger DR, Chao EY, Thompson C. Results of proximal tibial osteotomy. The effects of tibiofemoral angle, stance-phase flexion-extension, and medial-plateau force. J Bone Joint Surg Am. 1976 Oct. 58(7):952-60. [Medline]. Shaw JA, Moulton MJ. High tibial osteotomy: an operation based on a spurious mechanical concept. A theoretic treatise. Am J Orthop (Belle Mead NJ). 1996 Jun. 25(6):429-36. [Medline]. Khan FA, Koff MF, Noiseux NO, Bernhardt KA, O'Byrne MM, Larson DR, et al. Effect of local alignment on compartmental patterns of knee osteoarthritis. J Bone Joint Surg Am. 2008 Sep. 90(9):1961-9. [Medline]. [Full Text]. Moen TC, Laskin W, Puri L. The lateral compartment in knees with isolated medial and patellofemoral osteoarthritis: a histologic analysis of articular cartilage. J Arthroplasty. 2011 Aug. 26(5):783-7. [Medline]. Cooke TDV, Bryant JT, Scudamore RA. Biomechanical factors in alignment and arthritic disorders of the knee. Fu FH, Harner CD, Vince KG, eds. Knee Surgery. Baltimore, Md:. : Lippincott Williams & Wilkins; 1994. 1061. Goodman SB, Lee J, Smith RL, Csongradi JC, Fornasier VL. Mechanical overload of a single compartment induces early degenerative changes in the rabbit knee: a preliminary study. J Invest Surg. 1991. 4(2):161-70. [Medline]. Poilvache PL, Insall JN, Scuderi GR, Font-Rodriguez DE. Rotational landmarks and sizing of the distal femur in total knee arthroplasty. Clin Orthop Relat Res. 1996 Oct. 35-46. [Medline]. Washington ER 3rd, Root L, Liener UC. Discoid lateral meniscus in children. Long-term follow-up after excision. J Bone Joint Surg Am. 1995 Sep. 77(9):1357-61. [Medline]. Yoshioka Y, Siu D, Cooke TD. The anatomy and functional axes of the femur. J Bone Joint Surg Am. 1987 Jul. 69(6):873-80. [Medline]. Aglietti P, Bertini FA, Buzzi R, Beraldi R. Arthroscopic meniscectomy for discoid lateral meniscus in children and adolescents: 10-year follow-up. Am J Knee Surg. 1999 Spring. 12(2):83-7. [Medline]. Casscells SW. Gross pathological changes in the knee joint of the aged individual: a study of 300 cases. Clin Orthop Relat Res. 1978 May. 225-32. [Medline]. Dickhaut SC, DeLee JC. The discoid lateral-meniscus syndrome. J Bone Joint Surg Am. 1982 Sep. 64(7):1068-73. [Medline]. Ikeuchi H. Arthroscopic treatment of the discoid lateral meniscus. Technique and long-term results. Clin Orthop Relat Res. 1982 Jul. 19-28. [Medline]. Little C, Smith S, Ghosh P, Bellenger C. Histomorphological and immunohistochemical evaluation of joint changes in a model of osteoarthritis induced by lateral meniscectomy in sheep. J Rheumatol. 1997 Nov. 24(11):2199-209. [Medline]. 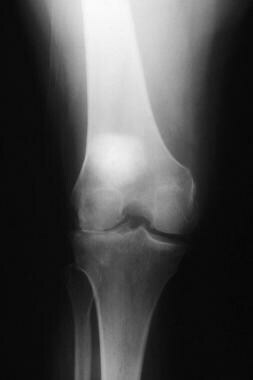 Ecker ML, Lotke PA. Spontaneous Osteonecrosis of the Knee. J Am Acad Orthop Surg. 1994 May. 2(3):173-178. [Medline]. Lotke PA, Ecker ML. 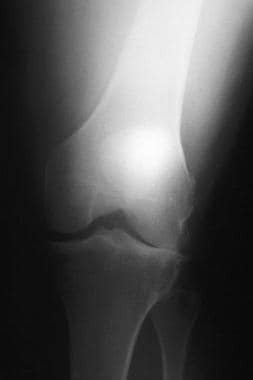 Osteonecrosis of the knee. J Bone Joint Surg Am. 1988 Mar. 70(3):470-3. [Medline]. Lotke PA, Ecker ML. 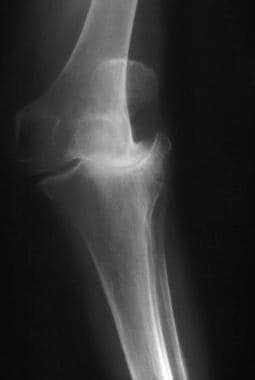 Osteonecrosis of the knee. Orthop Clin North Am. 1985 Oct. 16(4):797-808. [Medline]. Ohdera T, Miyagi S, Tokunaga M, Yoshimoto E, Matsuda S, Ikari H. Spontaneous osteonecrosis of the lateral femoral condyle of the knee: a report of 11 cases. Arch Orthop Trauma Surg. 2008 Aug. 128(8):825-31. [Medline]. Miyasaka KC, Ranawat CS, Mullaji A. 10- to 20-year followup of total knee arthroplasty for valgus deformities. Clin Orthop Relat Res. 1997 Dec. 29-37. [Medline]. Whiteside LA. Correction of ligament and bone defects in total arthroplasty of the severely valgus knee. Clin Orthop Relat Res. 1993 Mar. 234-45. [Medline]. Shakespeare D. Two clinical tests for assessing lateral compartment arthritis. Knee. 2006 Aug. 13(4):328-9. [Medline]. Dervin GF, Feibel RJ, Rody K, Grabowski J. 3-Foot standing AP versus 45 degrees PA radiograph for osteoarthritis of the knee. Clin J Sport Med. 2001 Jan. 11(1):10-6. [Medline]. Ahlbäck S. Osteoarthrosis of the knee. A radiographic investigation. Acta Radiol Diagn (Stockh). 1968. Suppl 277:7-72. [Medline]. Hernborg JS, Nilsson BE. The natural course of untreated osteoarthritis of the knee. Clin Orthop Relat Res. 1977 Mar-Apr. 130-7. [Medline]. Langlais F, Thomazeau H. Osteotomies du genou. Techniques chirurgicales. Encylopedie Medico-Chirurgicale. Editions scientifiques et medicales. Paris, France:. : Elsevier Science; 1989:. 1. Maquet P, Simonet J, de Marchin P. Biomechanics of the knee and gonarthrosis. Rev Chir Orthop Reparatrice Appar Mot. 1967 Mar. 53(2):111-38. [Medline]. Aglietti P, Menchetti PP. Distal femoral varus osteotomy in the valgus osteoarthritic knee. Am J Knee Surg. 2000 Spring. 13(2):89-95. [Medline]. Coventry MB, Bowman PW. Long-term results of upper tibial osteotomy for degenerative arthritis of the knee. Acta Orthop Belg. 1982 Jan-Feb. 48(1):139-56. [Medline]. Insall JN. Surgery of the Knee. Insall JN, Windsor RE, Scott WN, et al, eds. Osteotomy. 2nd ed. New York, NY: Churchill Livingstone; 1993. 635. Ivarsson I, Myrnerts R, Gillquist J. High tibial osteotomy for medial osteoarthritis of the knee. A 5 to 7 and 11 year follow-up. J Bone Joint Surg Br. 1990 Mar. 72(2):238-44. [Medline]. Majima T, Yasuda K, Katsuragi R, Kaneda K. Progression of joint arthrosis 10 to 15 years after high tibial osteotomy. Clin Orthop Relat Res. 2000 Dec. 177-84. [Medline]. Odenbring S, Egund N, Lindstrand A, Lohmander LS, Willén H. Cartilage regeneration after proximal tibial osteotomy for medial gonarthrosis. An arthroscopic, roentgenographic, and histologic study. Clin Orthop Relat Res. 1992 Apr. 210-6. [Medline]. Stuart MJ, Grace JN, Ilstrup DM, Kelly CM, Adams RA, Morrey BF. Late recurrence of varus deformity after proximal tibial osteotomy. Clin Orthop Relat Res. 1990 Nov. 61-5. [Medline]. Hanssen AD. Osteotomy about the knee: American perspective. Hanssen AD, Insall JN, Scott NW, et al, eds. Surgery of the Knee. New York, NY: Churchill Livingstone; 2001. 1461-2. Hernigou P, Duparc F, de Ladoucette A, Goutallier D. Recurvatum in arthritic genu valgum. Contraindication for osteotomy and unicompartmental prosthesis. Rev Chir Orthop Reparatrice Appar Mot. 1992. 78(5):292-9. [Medline]. McDermott AG, Finklestein JA, Farine I, Boynton EL, MacIntosh DL, Gross A. Distal femoral varus osteotomy for valgus deformity of the knee. J Bone Joint Surg Am. 1988 Jan. 70(1):110-6. [Medline]. Morrey BF, Edgerton BC. Distal femoral osteotomy for lateral gonarthrosis. Instr Course Lect. 1992. 41:77-85. [Medline]. Stubbs BT. Posterolateral arthritis of the knee. J Arthroplasty. 1995 Aug. 10(4):427-32. [Medline]. Cameron HU, Park YS. Total knee replacement after supracondylar femoral osteotomy. Am J Knee Surg. 1997 Spring. 10(2):70-1; discussion 71-2. [Medline]. Edgerton BC, Mariani EM, Morrey BF. Distal femoral varus osteotomy for painful genu valgum. A five-to-11-year follow-up study. Clin Orthop Relat Res. 1993 Mar. 263-9. [Medline]. Healy WL, Anglen JO, Wasilewski SA, Krackow KA. Distal femoral varus osteotomy. J Bone Joint Surg Am. 1988 Jan. 70(1):102-9. Healy WL, Wilk RM. Osteotomy in treatment of the arthritic knee. Scott WN, ed. The Knee. St Louis, Mo: Mosby; 1994. 1019. Mathews J, Cobb AG, Richardson S, Bentley G. Distal femoral osteotomy for lateral compartment osteoarthritis of the knee. Orthopedics. 1998 Apr. 21(4):437-40. [Medline]. Miniaci A, Grossmann SP, Jakob RP. Supracondylar femoral varus osteotomy in the treatment of valgus knee deformity. Am J Knee Surg. 1990. 2:65-73. Shoji H, Insall J. High tibial osteotomy for osteoarthritis of the knee with valgus deformity. J Bone Joint Surg Am. 1973 Jul. 55(5):963-73. [Medline]. Terry GC, Cimino PM. Distal femoral osteotomy for valgus deformity of the knee. Orthopedics. 1992 Nov. 15(11):1283-9; discussion 1289-90. [Medline]. Thein R, Bronak S, Thein R, Haviv B. Distal femoral osteotomy for valgus arthritic knees. J Orthop Sci. 2012 Nov. 17(6):745-9. [Medline]. Bauer GC, Insall J, Koshino T. Tibial osteotomy in gonarthrosis (osteo-arthritis of the knee). J Bone Joint Surg Am. 1969 Dec. 51(8):1545-63. [Medline]. Cameron HU, Botsford DJ, Park YS. Prognostic factors in the outcome of supracondylar femoral osteotomy for lateral compartment osteoarthritis of the knee. Can J Surg. 1997 Apr. 40(2):114-8. [Medline]. Coventry MB. Proximal tibial varus osteotomy for osteoarthritis of the lateral compartment of the knee. J Bone Joint Surg Am. 1987 Jan. 69(1):32-8. [Medline]. Harding ML. A fresh appraisal of tibial osteotomy for osteoarthritis of the knee. Clin Orthop Relat Res. 1976 Jan-Feb. 223-234. [Medline]. Marti RK, Verhagen RA, Kerkhoffs GM, Moojen TM. Proximal tibial varus osteotomy. Indications, technique, and five to twenty-one-year results. J Bone Joint Surg Am. 2001 Feb. 83-A(2):164-70. [Medline]. Akizuki S, Yasukawa Y, Takizawa T. Does arthroscopic abrasion arthroplasty promote cartilage regeneration in osteoarthritic knees with eburnation? A prospective study of high tibial osteotomy with abrasion arthroplasty versus high tibial osteotomy alone. Arthroscopy. 1997 Feb. 13(1):9-17. [Medline]. Elahi S, Cahue S, Felson DT, Engelman L, Sharma L. The association between varus-valgus alignment and patellofemoral osteoarthritis. Arthritis Rheum. 2000 Aug. 43(8):1874-80. [Medline]. Keene JS, Monson DK, Roberts JM, Dyreby JR Jr. Evaluation of patients for high tibial osteotomy. Clin Orthop Relat Res. 1989 Jun. 157-65. [Medline]. Beaver RJ, Jinxiang YU, Sekyi-Otu A, et al. Distal femoral varus osteotomy for genu valgum: a prospective review. Am J Knee Surg. 1991. 4:9. Conrad EU, Soudry M, Insall JN. Supracondylar femoral osteotomy for valgus deformities. Orthop Trans. 1985. 9:25. Maquet P. Osteotomy. Freeman MAR, Aubriot JH, eds. Arthritis of the Knee: Clinical Features and Surgical Management. Berlin, Germany: Springer-Verlag; 1980. 148. Aglietti P, Stringa G, Buzzi R, Pisaneschi A, Windsor RE. Correction of valgus knee deformity with a supracondylar V osteotomy. Clin Orthop Relat Res. 1987 Apr. 214-20. [Medline]. Beyer CA, Lewallen DG, Hanssen AD. Total knee arthroplasty following distal femoral osteotomy. Am J Knee Surg. 1994. 7:25. Cass JR, Bryan RS. High tibial osteotomy. Clin Orthop Relat Res. 1988 May. 196-9. [Medline]. Cameron HU. Repair of nonunion of supracondylar femoral osteotomy. Orthop Rev. 1992 Mar. 21(3):349-50. [Medline]. Healy WL, Iorio R, Lemos DW. Medial reconstruction during total knee arthroplasty for severe valgus deformity. Clin Orthop Relat Res. 1998 Nov. 161-9. [Medline]. Stähelin T, Hardegger F, Ward JC. Supracondylar osteotomy of the femur with use of compression. Osteosynthesis with a malleable implant. J Bone Joint Surg Am. 2000 May. 82(5):712-22. [Medline]. Cartier P, Sanouiller JL, Grelsamer RP. Unicompartmental knee arthroplasty surgery. 10-year minimum follow-up period. J Arthroplasty. 1996 Oct. 11(7):782-8. [Medline]. Marmor L. Lateral compartment arthroplasty of the knee. Clin Orthop Relat Res. 1984 Jun. 115-21. [Medline]. Ohdera T, Tokunaga J, Kobayashi A. Unicompartmental knee arthroplasty for lateral gonarthrosis: midterm results. J Arthroplasty. 2001 Feb. 16(2):196-200. [Medline]. Scott RD, Santore RF. Unicondylar unicompartmental replacement for osteoarthritis of the knee. J Bone Joint Surg Am. 1981 Apr. 63(4):536-44. [Medline]. Squire MW, Callaghan JJ, Goetz DD, Sullivan PM, Johnston RC. Unicompartmental knee replacement. A minimum 15 year followup study. Clin Orthop Relat Res. 1999 Oct. 61-72. [Medline]. Walton NP, Jahromi I, Lewis PL, Dobson PJ, Angel KR, Campbell DG. Patient-perceived outcomes and return to sport and work: TKA versus mini-incision unicompartmental knee arthroplasty. J Knee Surg. 2006 Apr. 19(2):112-6. [Medline]. Sah AP, Scott RD. Lateral unicompartmental knee arthroplasty through a medial approach. Surgical technique. J Bone Joint Surg Am. 2008 Oct. 90 Suppl 2 Pt 2:195-205. [Medline]. Berend KR, Kolczun MC 2nd, George JW Jr, Lombardi AV Jr. Lateral unicompartmental knee arthroplasty through a lateral parapatellar approach has high early survivorship. Clin Orthop Relat Res. 2012 Jan. 470(1):77-83. [Medline]. [Full Text]. Lustig S, Parratte S, Magnussen RA, Argenson JN, Neyret P. Lateral unicompartmental knee arthroplasty relieves pain and improves function in posttraumatic osteoarthritis. Clin Orthop Relat Res. 2012 Jan. 470(1):69-76. [Medline]. [Full Text]. Pandit H, Jenkins C, Barker K, Dodd CA, Murray DW. The Oxford medial unicompartmental knee replacement using a minimally-invasive approach. J Bone Joint Surg Br. 2006 Jan. 88(1):54-60. [Medline]. Price AJ, Waite JC, Svard U. Long-term clinical results of the medial Oxford unicompartmental knee arthroplasty. Clin Orthop Relat Res. 2005 Jun. 171-80. [Medline]. Soohoo NF, Sharifi H, Kominski G, Lieberman JR. Cost-effectiveness analysis of unicompartmental knee arthroplasty as an alternative to total knee arthroplasty for unicompartmental osteoarthritis. J Bone Joint Surg Am. 2006 Sep. 88(9):1975-82. [Medline]. Heyse TJ, Khefacha A, Peersman G, Cartier P. Survivorship of UKA in the middle-aged. Knee. 2012 Oct. 19(5):585-91. [Medline]. van der List JP, Zuiderbaan HA, Pearle AD. Why Do Lateral Unicompartmental Knee Arthroplasties Fail Today?. Am J Orthop (Belle Mead NJ). 2016 Nov/Dec. 45 (7):432-462. [Medline]. [Full Text]. Berruto M, Bianchi M, Laurà G. Surgical treatment of arthritic valgus knee: femoral supracondylar osteotomy or knee replacement?. Ital J Orthop Traumatol. 1993. 19(1):33-41. [Medline]. Finkelstein JA, Gross AE, Davis A. Varus osteotomy of the distal part of the femur. A survivorship analysis. J Bone Joint Surg Am. 1996 Sep. 78(9):1348-52. [Medline]. Krackow KA, Jones MM, Teeny SM, Hungerford DS. Primary total knee arthroplasty in patients with fixed valgus deformity. Clin Orthop Relat Res. 1991 Dec. 9-18. [Medline]. Laurencin CT, Scott RD, Volatile TB, Gebhardt EM. Total knee replacement in severe valgus deformity. Am J Knee Surg. 1992. 5:135-9. Krackow KA. The Technique of Total Knee Arthroplasty. St Louis, Mo: Mosby; 1990. Scott CE, Nutton RW, Biant LC. Lateral compartment osteoarthritis of the knee: Biomechanics and surgical management of end-stage disease. Bone Joint J. 2013 Apr. 95-B(4):436-44. [Medline].